Between tours we had some time to explore St. Stephen’s Cathedral. 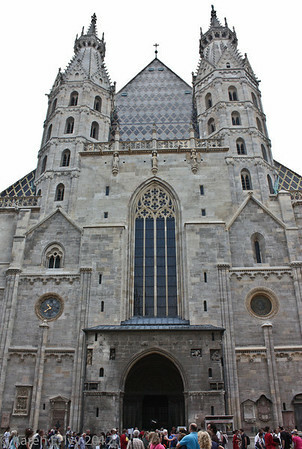 The current form of the cathedral dates to the mid-14th century, a combination of the Romanesque and Gothic styles. The first church on the site was consecrated in 1147. The Wikipedia article has detail on the cathedral’s ring of bells, which is still in use, although we didn’t hear it. I’ve been interested in church bells since reading Dorothy Sayers’ The Nine Tailors. The Wikipedia article has much interesting information about the cathedral. 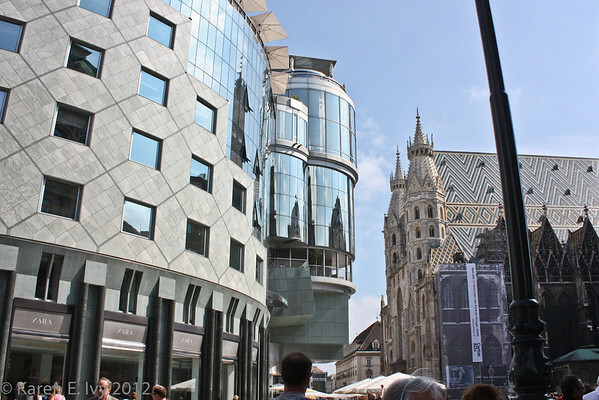 The bulgy glass edifice is Hans Hollein’s “Haas Haus.” Wikipedia doesn’t have much on it, and neither did any of the tourist sites I found when I Googled it; it’s just a building. It seems to have been built deliberately to reflect the Dom. Notice the elaborate tile patterns on the Dom roof. You’ll see it again in Budapest, where it’s even gaudier, when I get that tour posted. I don’t know if that’s a Central European thing or what. None of the other cathedrals had patterned tile roofs. Notice also the three black gables with Gothic arches, on this side of the Dom below the tile roof. Those are not black because they’re in shadow. They’re black because they haven’t been cleaned yet, from seven hundred odd years of wood and coal smoke! That’s what the scaffolding is all about, next to them. Here’s the front entrance of the Dom. 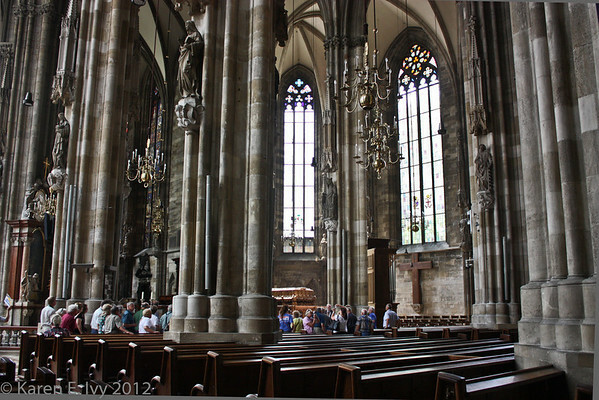 All the photos I took of the Dom are in the gallery called St. Stephen’s, Vienna. Here’s a carved pillar, with an inset painting that may represent the Annunciation. It’s all very ornate. If you want to see the details close up, go to the gallery and you can enlarge the view. But as I walked closer to the staircase, I noticed something very odd on the handrail. What on earth are these little stone critters crawling up – or down? – the handrail? I can’t recall seeing this anywhere else. 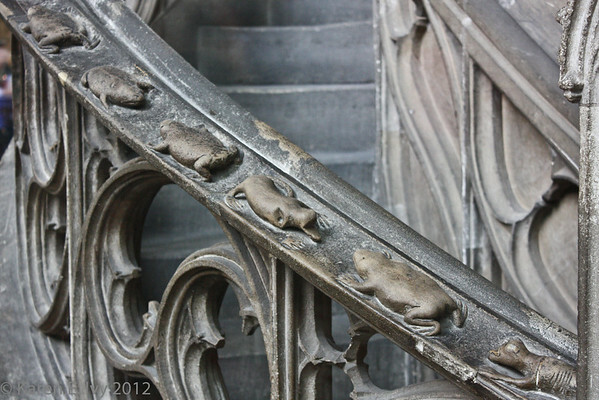 Wikipedia tells me they represent “toads and lizards biting each other, symbolizing the fight of good against evil.” It also says that a stone puppy at the top of the stairs protects the preacher from intruders, but I couldn’t see the puppy; they don’t allow tourists to climb the pulpit stairs. 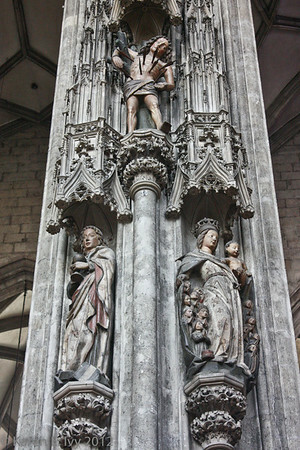 I don’t know when the statues on this column were carved; they look pretty late, they’re very realistic – especially St. Sebastian, at the top, with his arrows. 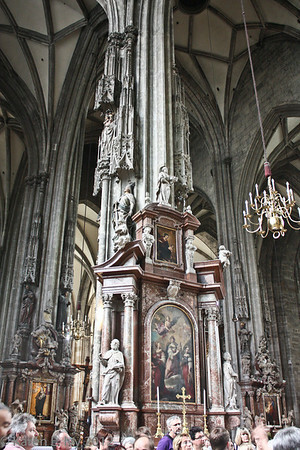 The lower statue on the right was identified as the Madonna with the Protective Mantle. You can still see traces of the colors they were originally painted. 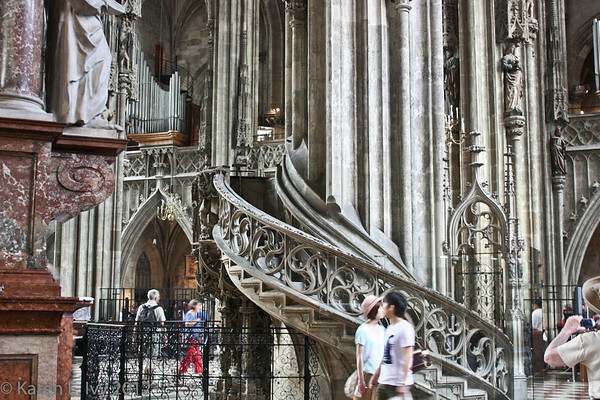 After exploring the cathedral, we found the cathedral museum, up a stair to a sort of mezzanine under the organ. 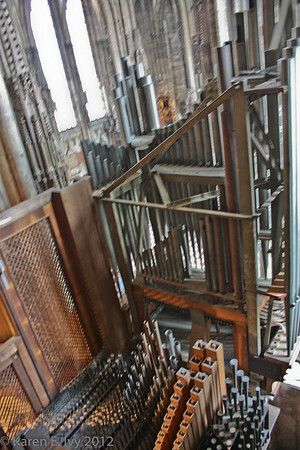 It was kind of enclosed by the organ, and I got some unusual photos of organ innards. This is a little out of focus – which give it a rather Escher-like feel – the light there was dim enough that depth of field was impossible. There are more organ photos in the gallery. We could also, of course, see the larger parts of the organ. 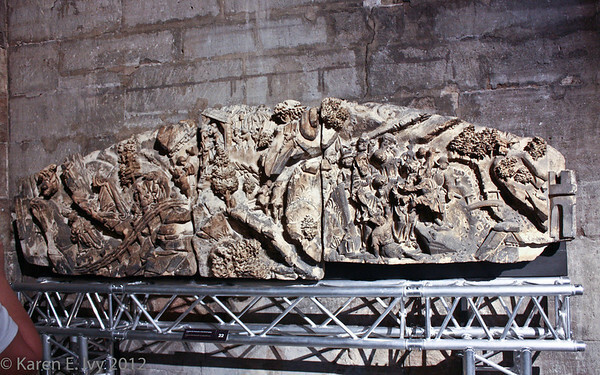 This is one of several very modern wood carvings which supported groups of larger pipes. Again, there are more photos in the gallery. 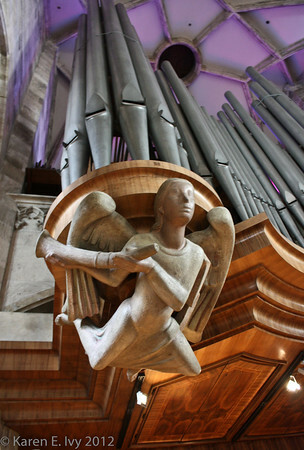 The organ and its associated carvings are quite beautiful. I don’t know why they chose to illuminate it with purple light unless it’s some association with the old Empire. Behind and around the organ, though, was the museum. 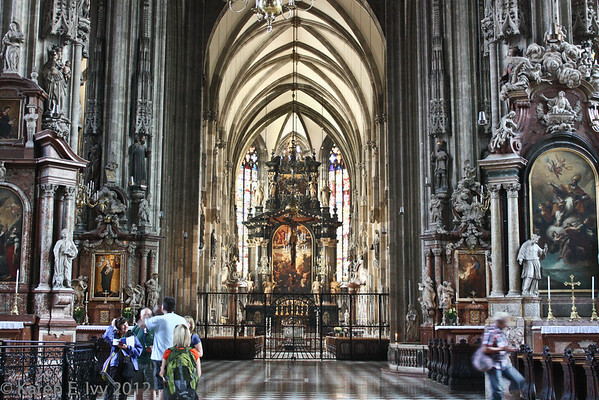 Every major cathedral had some kind of elaborate reliquary with a saint’s relics, and St. Stephen’s had one too. 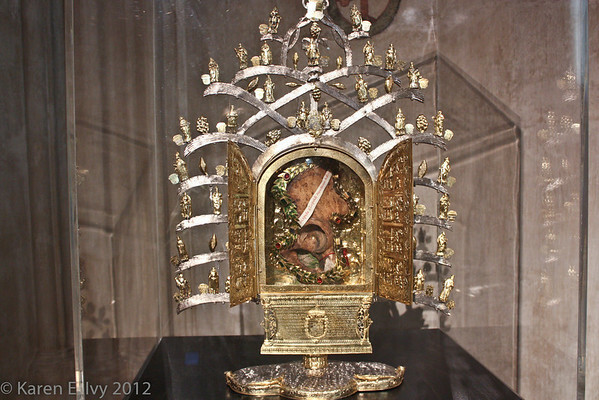 Here is an elaborate reliquary with the scapula of St. Leonard. The scapula is a large bone and it’s very clear here. I wonder what miracles it was supposed to perform. 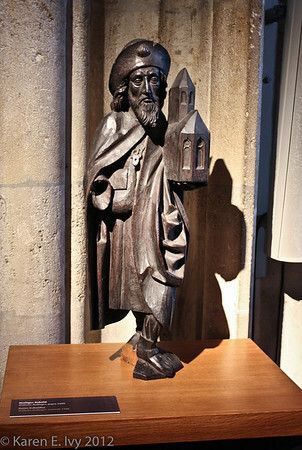 Among other things the museum had this nice late 15th century statue of St. Sebaldus, carrying a church. 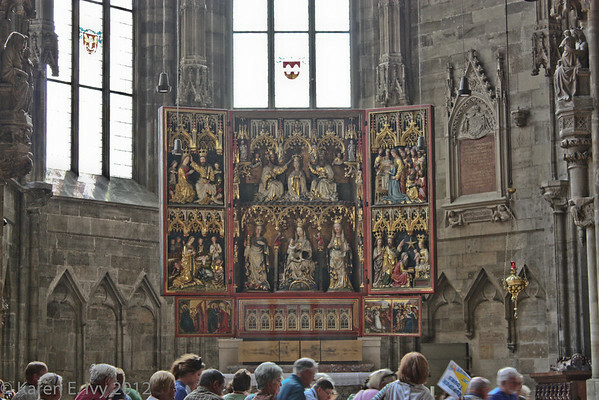 St. Sebaldus was the patron saint of Nuremburg, and has a church named after him in that city. There’s very little known about this saint, but his cult can be dated to the late 11th century. Unusually for a medieval art work, the carver is known, one Wilhelm Rollinger. 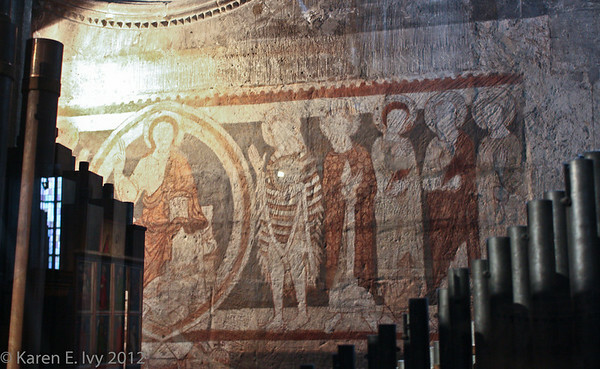 Most interesting to me was a surviving fresco, uncovered during renovations. This wasn’t well documented but I’m pretty familiar with medieval art trends, and I’d place this in the 12th century, or not much later, largely because of the total lack of perspective. Compare it with the St. Sebaldus statue, or for that matter any of the statuary in the church proper, and you’ll see what I mean. This entry was posted in Photography, Vacations and tagged 2012 Vacation.